To review this adequately, I need to offer some background. From circa 2500 to 2000 BCE, Ancient Greek civilization essentially molded what would become Western Civilization. Art, architecture, government, and communication were spear-headed by the Greeks. In particular, Greek sculpture and marble relief were the envy of Ancient Europe. Then with the dawn of the Middle Ages and the rise of Christianity, their Civilization was all but forgotten. Many texts were lost. Their buildings crumbled. Many statues were destroyed by Christian iconoclasts. Then in one of the most fascinating turns of history, Renaissance Humanism in Europe rediscovered ancient Roman and Greek culture. At first their texts were rediscovered in the 15th century and eventually printed in the late 15th and 16th centuries. And then in the 17th century, a new group of scholars which eventually be labeled antiquarians set out to find and understand both ancient and medieval culture and artifacts. By the 18th century, a rebirth of interest in ancient art and antiquities flourished all over Western Europe. In the 18th and 19th century, these scholar began excavating old ruins and ushered in a new field: archeology. Items were taken to newly founded museums in Europe. In particular, the Rosetta Stone and the Elgin Marbles ended up in the British Museum in the early 19th century. Fast-forward 200 years. Now some countries are claiming certain artworks artifacts should return their countries of origin. In particular, the Elgin Marbles which once resided inside the Parthenon in Greece are in the midst of a cultural tug-of-war. Greece claims they should return to Greece, and the UK believes they are rightfully theirs. 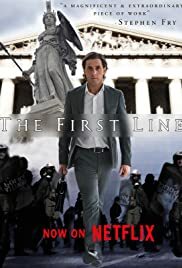 The present film is about a fictionalized court case in which an American-Greek attorney fights in court for Elgin Marbles to be returned to Greece. The premise is definitely a fascinating idea. Unfortunately, the film is quite uneven. The attorney for Greece, Andreas (Pantelis Kodogiannis) upholds well in a script that at times became enigmatic. Some of the scenes are in flashback and it sometimes became confusing when were in "present time" and when were in the past. The rioting in Greece as a result of the financial crisis are shown in flash-back, and it wasn't clear until well into the film why were seeing the riots. There is also a love interest, Eleni (Kassandra Voyagis). We finally understand they had been lovers and Andreas left Greece, but it's never made clear what exactly their relationship had been. Also the portrayal of the British museum curators was much to be desired. They are portrayed as pompous and self-righteous, as if the film wants us to despise them and have us root for the Greeks. As to the question of the Elgin Marbles: the interesting aspect of all this is that when the Greeks became what we now call Greek Orthodox Christians in late Antiquity and the Middle Ages, for nearly 2000 years, they didn't care at all about their ancient past. These items were all around them, but the Greek Orthodox Church regarded them as heathen. Renewed interest in Antiquity began in Western Europe in the late Renaissance and Enlightenment, not in Greece. British and French scholars from the late 17th to the early 19th century were the ones who began finding and studying ancient art and antiquities. Greek and Egyptian scholars did not come to the scene until much later. It was the French and the British, and to some extent the Italians, who saw the value in these artifacts. A French and British scholar were the ones who first figured out how to translate Egyptian hieroglyphs. Now of course, Greece claims they made a grave error centuries ago by not treasuring their past. They were behind the French and the British by almost 300 years! And yet they feel they have to right to the items now held in the British Museum. My question, which is not addressed in the film: what would have happened to these artifacts if they had not been confiscated by the British and French? They may have been lost to time.